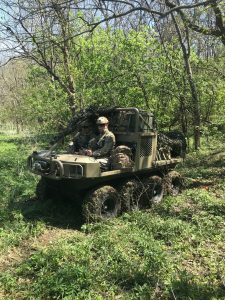 Soteria Trials and Development Ltd deployed to Missouri, US on a contract to support Hippo Multipower Ltd develop its All Terrain Support Vehicle (ATSV). The task was to trial a prototype of the Mk 2 HIPPO ATSV. The Soteria team (six personnel) spent 14 days in country working alongside the Hippo engineers to test, develop and provide change proposals to mitigate design or performance shortfalls. The same team look forward to delivering further trials in Hot Dry and Hot Wet climatic conditions later in the year.